The kitchen is definitely the heart of every home. More often than not, our family gathers there to chat, celebrate, eat, do homework and watch tv. Our garage is located off the kitchen, making it a high traffic area and difficult to keep clean.When we moved into our home, our first project was to clean the grout lines in our kitchen. They were so filthy, we hired a company to come out and “color seal” the grout. What is color sealing? Color sealing is basically painting the grout lines. The company we hired had 25 grout colors to select from..I like choices..but sometimes too many choices is overwhelming. This is a picture of our kitchen floor tile, half is sealed, and half isn’t. Big difference right? That is how dirty our grout was before color sealing. Color sealing works on all grout, making it a great choice if you want to brighten up or change the color of your grout. For our kitchen renovation, I attempted a DIY color sealing project. We have a marble backsplash over the kitchen range, and the grout has become badly stained with oil and grease from the stovetop. This is the before picture of the marble backsplash showing the dirty grout lines. I recommend cleaning the grout lines before beginning the color seal process. I used a combination of 1 part hydrogen peroxide and 2 parts baking soda. The combination creates a thick paste. I brushed the solution onto the grout lines with an old toothbrush. I allowed it to sit 30 minutes and wiped off with a wet cloth. The challenge here was cleaning the grout lines on a vertical surface, the mixture was slipping down the tile. 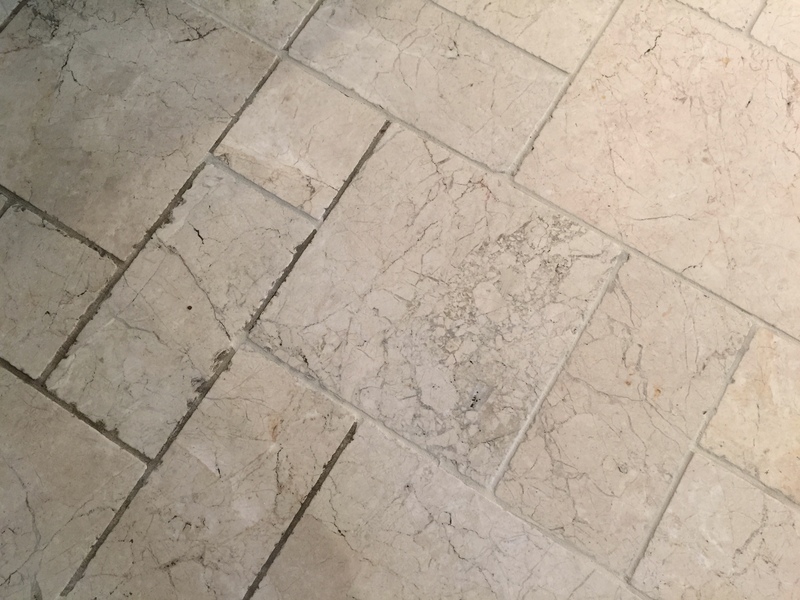 Cleaning grout lines on a floor is much easier, for that I recommend pouring the hydrogen peroxide on the grout lines and rubbing baking soda into the grout with a toothbrush, wipe off after 30 minutes. The combination of peroxide and baking soda did a decent job on this vertical surface. But since I am going to color seal the grout, I don’t need it to be perfect. The color seal color I used is bright white HERE . Simply brush the sealer onto the grout with a toothbrush, it’s that easy. I recommend wiping off the excess with a dry towel immediately after applying to avoid drying on the tile. This picture shows 3 grout lines color sealed and one left untouched. The final results are amazing. The tiles immediately appear cleaner and brighter. A little paint goes a long way, one bottle can paint a large surface area. Alert all entrepreneurs, people are paying big money to get their grout color sealed instead of replaced, and it’s supposed to last 5 years. Business Opportunity! Grout sealing has become a HUGE business. For the DIY’er, I definitely recommend color sealing grout as an easy, and very cost effective way to renew or change the color of your grout lines. You can change the grout color from dark to light or even light to dark. Give it a shot and let me know how it turns out! Feel free to share or Pin this post. To get all post delivered right to your inbox, subscribe to the blog and follow along on Instagram HERE. Thanks Joe, It was so easy, quick and inexpensive too! Something else we have in common – paint grout! However, I took the lazy way out and paid someone else to do it in our condo kitchen. Color me happy! Good for you! It’s such a clever idea, I love it. it looks good, keep up the good work. It is time I start doing the bigger project at home haha! Thank you for the inspiration! I should stop paying outsiders to come and do them. This project was really easy and very cost effective. I definitely recommend a DIY for this one! I will be having lots to do when I move into my next home. Just cannot wait. Thank you for your inspiration. I will be doing lots by myself. Did I miss something Juli? Are you moving?